This is an average face of 40 babies. It took about an hour to make this face image. Save this image to the photo library, and remove all registered faces (or switch to an empty workspace). Suppose she is a bride. Average face of the (hypothetical) bridal couple, whose characteristics are intermediate between the bride and the groom. Save this (weird) image to the photo library. Remove the faces (or switch to an empty workspace). Load the average face of the bridal couple, and register it as the first face. 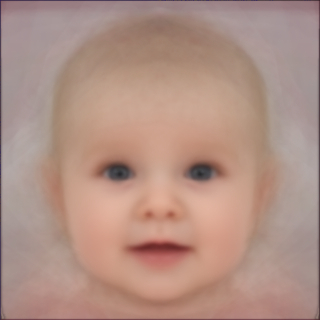 Then, load the babies' average and generate a new average face. This is a predicted face of their baby. Obviously, there is no scientific ground for this prediction. I wanted to increase the babyishness of the face. 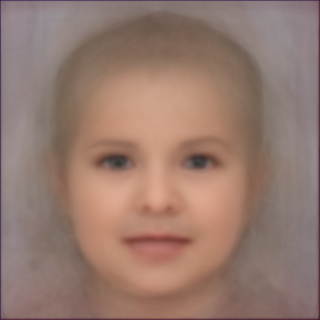 So, I loaded the baby average face again and generated a new average. 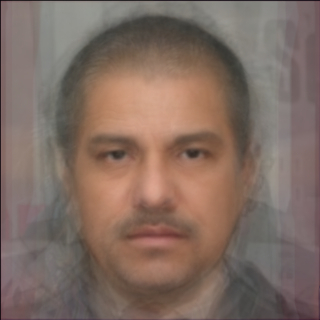 The generated face was more babyish, but not so similar to the bridal couple.